Bideford is soon to have a new shipyard on the lines of that made famous by Appledore Shipbuilders Ltd. The new factory – partner in the new firm, round-the-world yachtsman Mr Alan Smith, of Littleham, prefers to think of it in that term – will turn out mainly all steel craft in a covered yard. Subject to signing this weekend of a contract, he and a naval architect have bought for an undisclosed figure from North Devon Farmers Ltd what was formerly Blackmore’s shipyard situated above Bideford Bridge. Attractions ranging from a vintage vehicle display that drew 65 entries to a dog show and from a gymkhana to children's sports, provided something for everyone at Littleham fete on Saturday which was opened by Mr Michael Pope, who was introduced by the chairman of the Parish Hall committee, Mr L J Badcock. Flowere were presented by Andrea Clegg and June Pennington. The funeral of Miss Mabel Hearn of 'Lower Langdon', Littleham, took place at Littleham Parish Church. The Rev L Budge officated and Mr Richards accompanied the hymns. Immediate mourners were: Bessie, Nellie, Ada, Fred, Syd and Will, Mary, Edith, Gertrude, Cephas and Rodney Brend, Mary and Cyril Marshall, Phyllis and Stanley Wood, Phyllis and Aubrey Phelps, Tot Ford. Norah, Daisy and Annie were unable to attend. Only nine pins prevented Littleham A from becoming the skittles champions of the Westcountry. Littleham put up a fine performance to reach the championship final from over 300 entries before going down to Watchet All Stars 505-497. The quarter-finals, semi-finals and final were held at Newton Abbot and Littleham skittled consistently to average 500 a game in their three nine-rub matches. Visitors around the chair of 96-year-old Mrs Eliza Wise represented five generations of a Littleham family. Her daughter is Mrs Mary Ann Beer, of Mount Pleasant, Littleham, who is 77. She and her husband John celebrated their golden wedding last April. Their son, Mr Arthur Beer, works at Axminster and lives at Mount Pleasant. His daughter, Mrs Margaret Ann Smale, gave birth to a daughter, Mrs Wise's great-great granddaughter, christened Mandy Sylvia Mary. 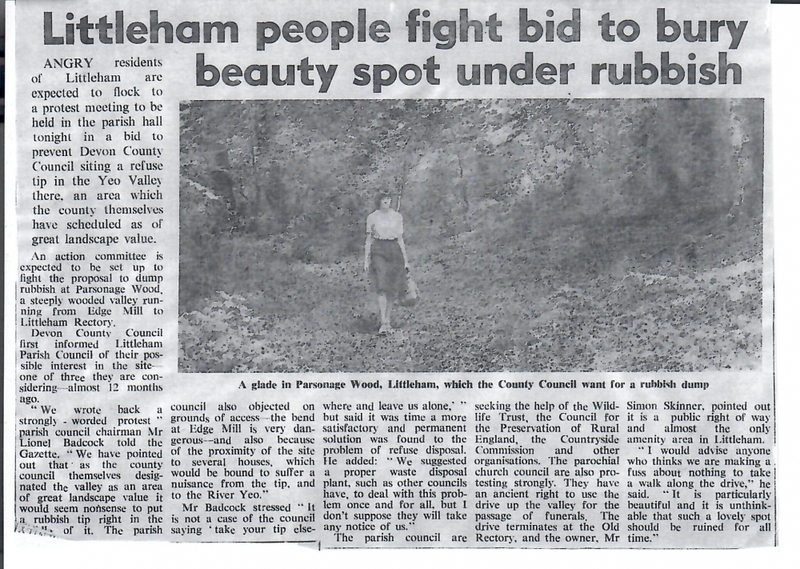 Angry residents of Littleham are expected to flock to a protest meeting to be held in the parish hall in a bid to prevent Devon County Council siting a refuse tip in the Yeo Valley, an area which the county themselves have scheduled as of great landscape value. Mr Lionel Badcock parish council chairman stated that he had wrote back a strongly worded protest. Mr Simon Skinner pointed out it is a public right of way and almost the only amenity area in Littleham.